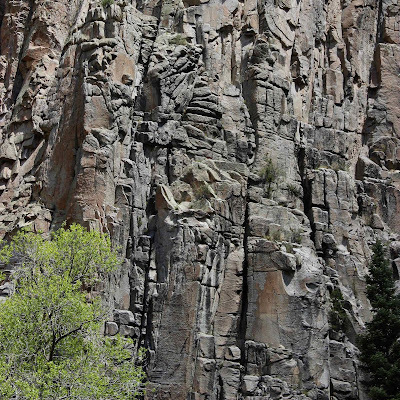 The Palisades in Cimarron Canyon, northern New Mexico. 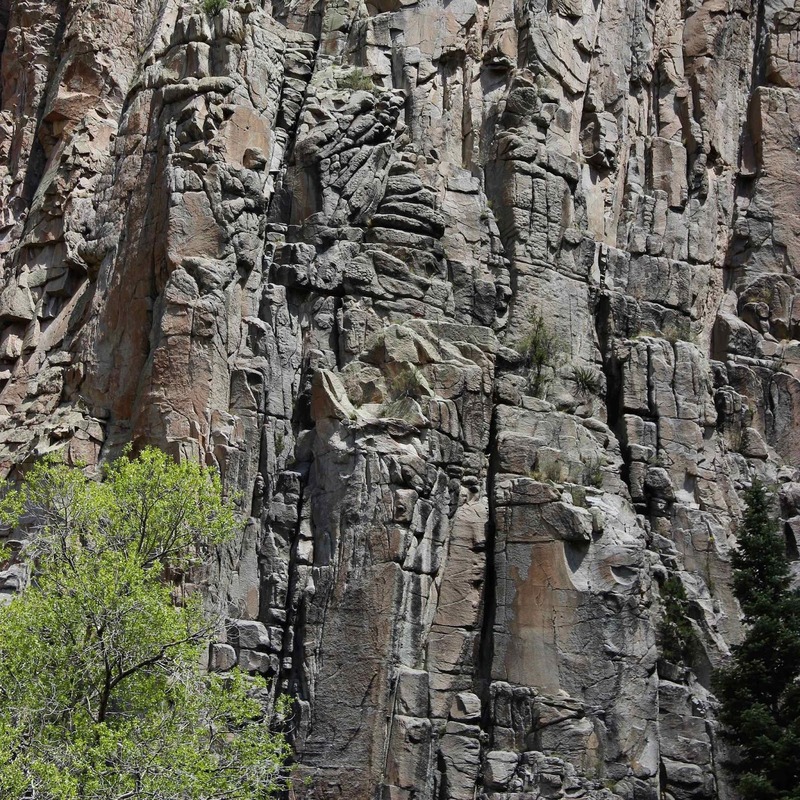 Browsing through my photos of the Cimarron Canyon Palisades, I spotted an odd form on the crest which I hadn’t noticed when I was there. 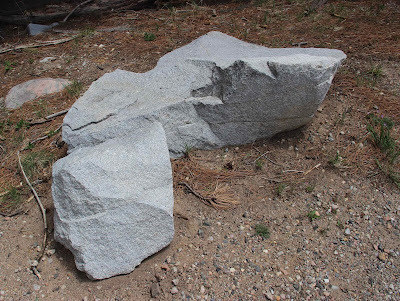 Is that really rock? Zooming in showed nothing to suggest otherwise. But how improbable! I’m hardly the first to spot this weird finger of rock. Years ago someone thought it odd enough to add to the Devil’s collection of landforms and landmarks—Devil’s Postpile, Devil’s Backbone, Devil’s Thumb, Devil’s Racetrack, Devil’s Marbles, Devil’s Gate, etc. In this case, we have the Devil’s Mailbox. Devil’s Mailbox; Pomona Public Library, Frasher Foto Postcard Collection, 1938. Unfortunately, the Mailbox story ends here, as my “research” (Google) produced no further details. 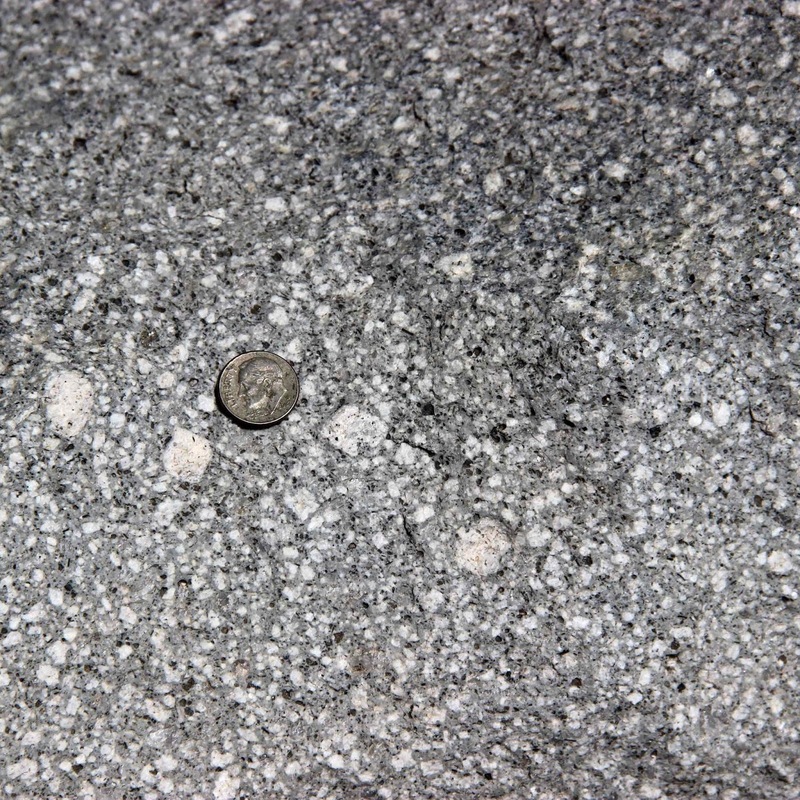 In contrast, the story of its context is much longer, on the order of 40 million years. 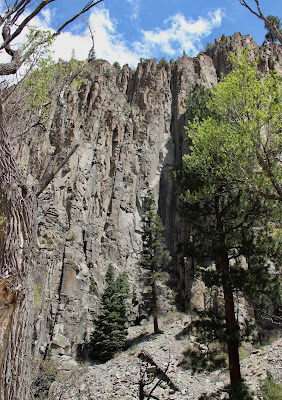 The Mailbox is part of the Palisades sill, a massive sheet of igneous rock intruded into sedimentary strata of the Cimarron Range. This may have happened during creation of the range, part of the Laramide Orogeny, the mountain-building episode that built the Rocky Mountains. 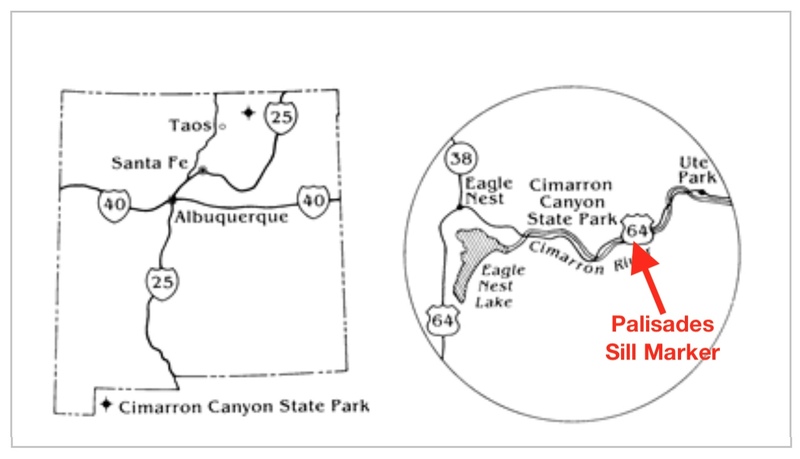 In a later episode of uplift, maybe 20 or 30 million years ago, the Cimarron River cut down through the range revealing part of the sill, in cross-section. 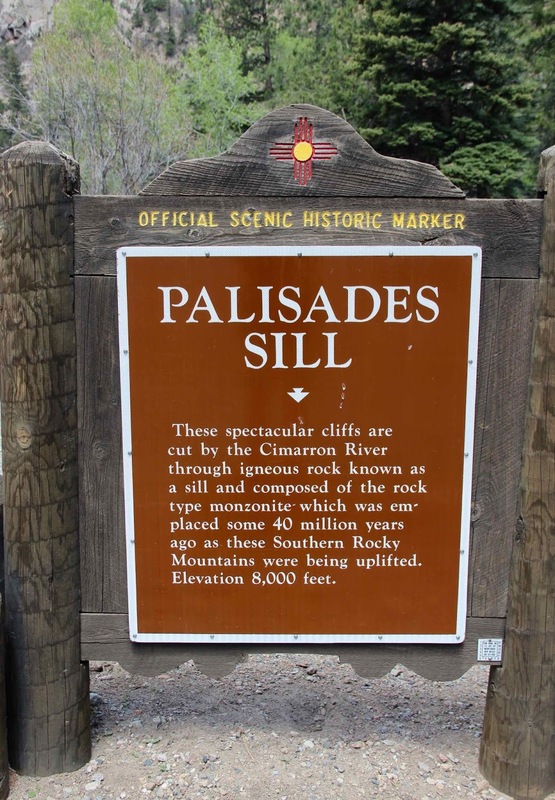 The dramatic exposure is called the Palisades, and is part of Cimarron State Park. 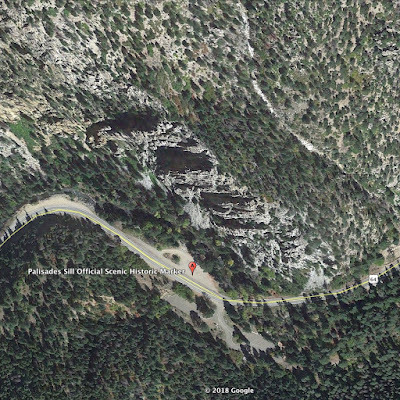 There’s a convenient pullout at the base, along US Highway 64. Actually, the details are still being debated. 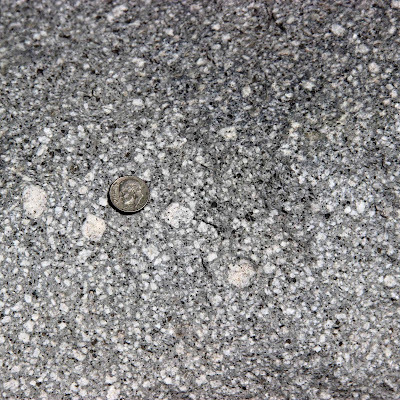 The rock looked porphyritic to me, i.e., large phenocrysts in a matrix of fine-grained rock. This is easy to see in the blocks lining the pullout. 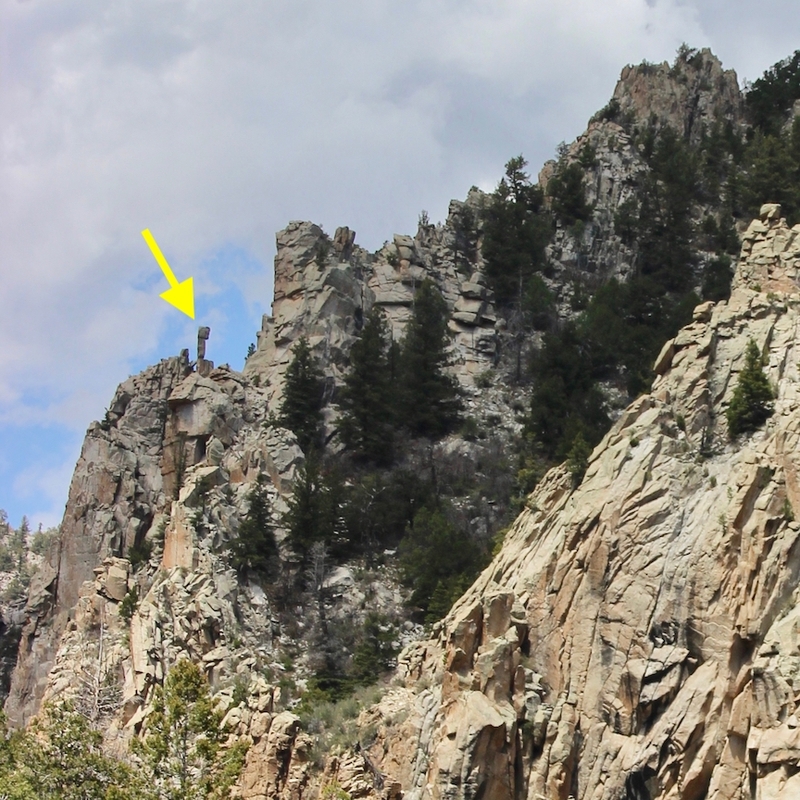 The columns and towers of the exposed sill are spectacular. 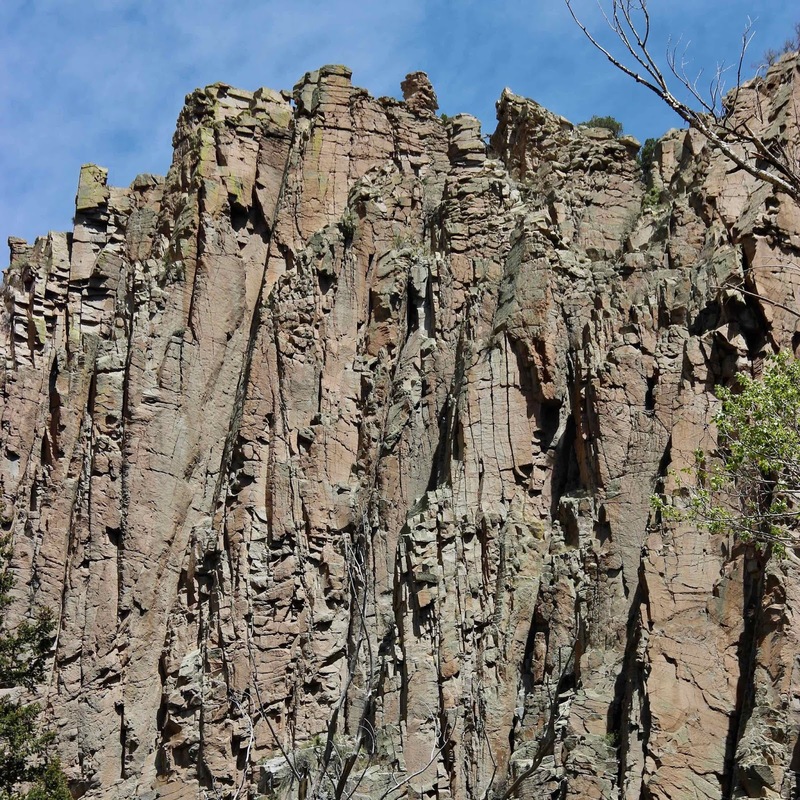 They're separated by long vertical joints that formed as the intruded magma cooled, underground. 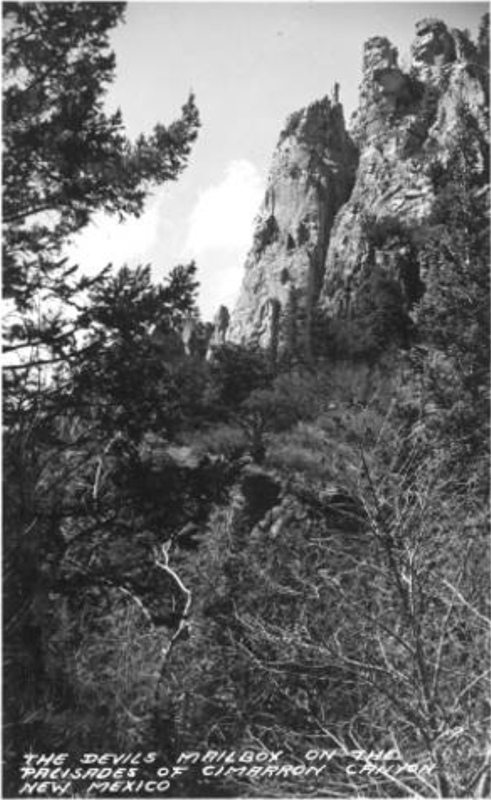 Later, water seeped into the fractures, and froze and expanded in winter, slowly breaking the rock. This went on for millennia, producing talus slopes at the base (and rock blocks for the pullout). 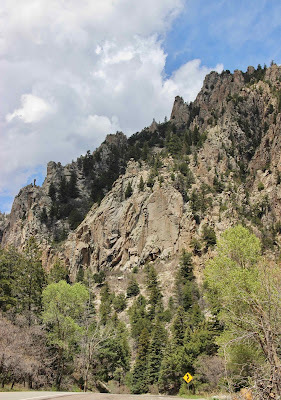 Talus slope at base, apparently stable enough for trees to grow large. 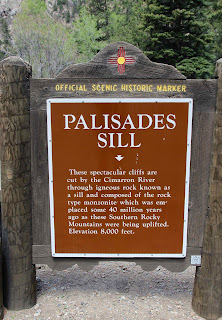 The Palisades Sill Official Scenic Historic Marker is on US Highway 64 in Cimarron Canyon State Park, about 8.3 miles east of Eagle Nest and 15.5 miles west of the town of Cimarron (36.537449° -105.152374°). 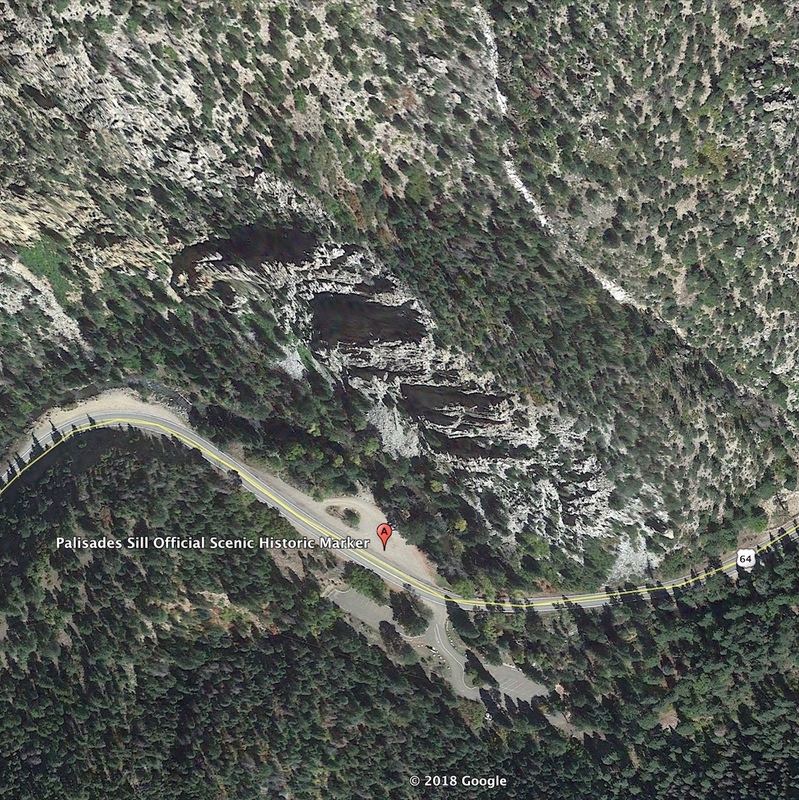 The Mailbox stands near the northwest end of the ridge visible from the highway. 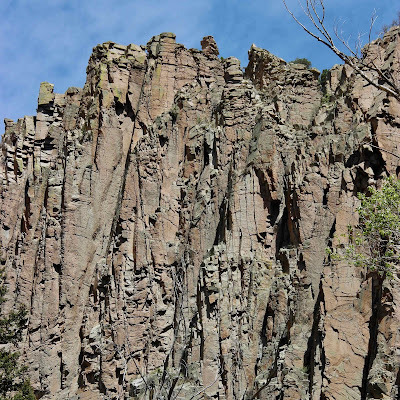 The Palisades sill is included in New Mexico’s Virtual Geologic Tour, a terrific trip-planning resource. 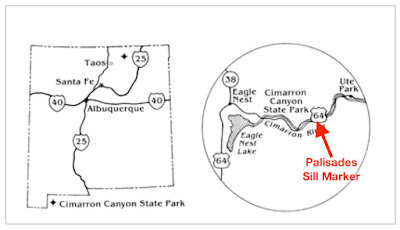 The Cimarron Canyon State Park page includes a substantial list of references.